Did you know that the spiritual suffering of Jesus was prophesied 1,000 years before he endured it on the cross? Don and I then got together on my television show "Christ in Prophecy" to discuss how Psalm 22 is one of the most prophetic chapters concerning the crucifixion of Jesus Christ (watch!). We discussed how particularly remarkable it is that the descriptive prophecy concerning Jesus' death was written more than one thousand years before Jesus was born, and more than 700 years before the Romans perfected crucifixion as a method of execution. Dr. Reagan: In addition to the fact that Bible prophecy validates Jesus as God in the flesh, it also helps us to better understand Jesus, to understand who He was and what He did. Psalm 22 is one of the most remarkable prophecies in the Bible. Keep in mind that it was written by David 1,000 years before the birth of Jesus. The psalm begins with a cry of lament with these words, "My God, my God, why have You forsaken me? Far from my deliverance are the words of my groaning. O my God, I cry by day, but You do not answer; and by night, but I have no rest." Well, as you can see, the psalm begins with an agonizing cry of despair. David cries out, "Where are You, God?" He bemoans the fact that although he has been seeking the Lord's help both day and night, all he has received in response is silence. Don McGee: Have you ever had that experience? Well, if you pray regularly, I know you have. It happens because God answers prayers in three ways: Yes, No, and Wait. Yes and No we can deal with. It is the waiting that wears on our nerves. We usually desire instant gratification rather than God's will in His perfect timing. Dr. Reagan: David had experienced this feeling before. An example can be found in Psalm 6 where he wrote, "I am weary with my sighing; every night I make my bed swim, I dissolve my couch with my tears. My eye has wasted away with grief; it has become old because of all my adversaries." David is saying here, "Lord, my bed is wet from my tears. My eyes are weary from my grief. When are you going to hear me and respond?" This type of statement is not evidence of a loss of faith. The psalmist would not even bother to cry out to God if he had lost his faith. It is more an expression of impatience and a verbalization of a sense of desperation. 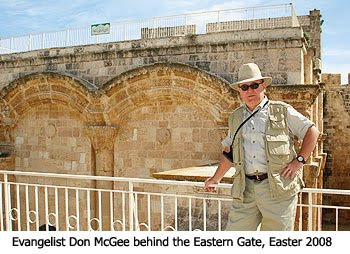 Don McGee: In fact, after issuing his cry of despair, David immediately reaffirms his faith in God. He reminds himself of God's faithfulness by proclaiming, "Yet, You are holy, O You who are enthroned upon the praises of Israel. In You our fathers trusted; they trusted and You delivered them. To You they cried out, and were delivered; In You they trusted, and were not disappointed." As if to preserve his sanity in the midst of suffering, the psalmist reminds himself of God's faithfulness in responding to the desperate needs of his forefathers. Dr. Reagan: It is one thing for David to cry out to God in desperation in his frail humanity. But, how can the fact be explained that Jesus, the Son of God, exclaimed the same plaintive cry while hanging on the cross? Listen to what it says in Matthew 27:46. Matthew writes, "About the ninth hour, 3 p.m., Jesus cried out in a loud voice saying, 'Eli, Eli, lama sabachthani?' that is, 'My God, My God, why have You forsaken Me?'" Again, how can such words coming from the mouth of the Son of God be explained? I believe, as with David, this expression was not related to a loss of faith. Rather, it was a desperate cry of inexpressible agony and lament over the separation from God the Father that Jesus experienced on the Cross. Don McGee: You see, the greatest suffering that Jesus experienced in His passion was not physical or emotional, it was spiritual. Think of it. He had experienced eternally a perfect fellowship of love with God the Father. Then, suddenly, that sweet communion was broken because your sins and mine were placed on Jesus, and the wrath of God, which we deserve, was poured out on the Son. Here's how the apostle Paul put it in 2 Corinthians 5, "He (that is God the Father) made Him (Jesus) who knew no sin to be sin on our behalf, that we might become the righteousness of God in Him." Dr. Reagan: The perfect fellowship between Father and Son was broken because our sins were placed on Jesus, and the holiness of God cannot countenance sin. God the Father had to turn His back on His Son, prompting Jesus to cry out from the depths of His soul, "My God, My God, why have You forsaken Me?" In the next part of this series on the Passion in Bible Prophecy, well begin to understand the intense physical suffering Jesus endured at the crucifixion. let`s see if i can articulate this well: if his fellowship with the father had never been broken, and it being broken for the 1st time ever caused that much agony, then perfect fellowship with the father must be unexplainably, indiscribably more wonderful than any fallen human could ever even possibly imagine. us fallen humans are use to a severed or imperfect fellowship. it makes me wonder what perfect fellowship will be like. specially if losing it caused jesus such suffering.